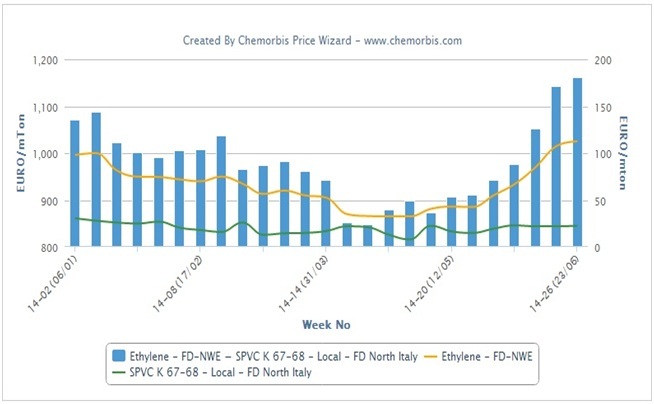 According to ChemOrbis, PVC players in Europe are wrapping up their April transactions with increases ranging between €70-150/ton for various origins, with some sellers claiming to have been sold out in the first half of this month. May expectations already started to be expressed for refreshed hike attempts, albeit for relatively modest amounts. This is based on rising ethylene costs while additional supply issues in the region reinforced firm sentiment for the approaching month. A West European PVC producer obtained €100/ton increases for April deals. A source from the producer attributed strong hikes to increasing feedstock costs for naphtha in addition to ethylene, for which availability is tight in Europe. “We expect the shortage to extend into May which may boost new hike requests,” the source stated. Another West European supplier reported short supply and good demand for the current month while they could only provide material for their regular customers. “The May outlook is bullish considering the rise in spot ethylene prices and lack of import PVC cargos,” a producer source noted. In Italy, a distributor managed to achieve €120-150/ton hikes after trimming his initial April target of €170/ton. “We foresee smaller increases next month since supply may ease a bit,” he mentioned. A converter also voiced his forecast to see €10-20/ton gains for the coming month, while another one commented that supply issues would set the tone rather than production costs. Spot ethylene prices soared €130/ton on FD NWE basis with respect to early April. Naphtha gained $20/ton in Northwest Europe in the period. A PVC compounder in Italy was not able to get any offers from his South and Central European suppliers and had to use near prime PVC during April. Another converter preferred to build some stocks taking short supplies and expectations for further price hikes regarding May into account. “However, the market may see a reversal starting from June or July,” he commented. Buyers in Germany agree that new PVC hikes are likely to be right around the corner due to a number of factors including higher energy costs, according to ChemOrbis. ICE Brent crude futures gained around $5/barrel since April started. Plus, there are some PVC shutdowns in the country. A West European producer is experiencing production issues at their PVC plant in Germany due to an ethylene shortage following their supplier’s force majeure declaration. Another West European producer’s PVC plant in Germany is offline for a turnaround which will last until the end of April.